A gun safe is the metal container that can store firearms, ammunition, and other valuables such as jewelry or personal documents. Gun safes are designed to lock out burglars and other unauthorized people such as children, while also being able to resist physical damage and fire for an extend period of time. In today’s world, gun safes have largely eclipsed wooden cabinets as the best way to store guns. The reason why is because the best gun safe is meant to provide protection and security, not look pretty. No two gun safes are created equal. There are many different gun safes that use different locking systems, constructed from different materials, or are made for different purposes. If you’re on the market for your first gun safe but don’t know what to get, we’re here to help. In this extended article, we will cover the different types of gun safes on the market, the pros and cons of each, the qualities you need to look for in a gun safe, and then the best gun safes by category. In its most basic form, a gun safe is simply a secure storage unit for holding firearms, ammunition, and other valuable and that can be locked. In some areas of the country, gun safes are required for gun owners because certain jurisdictions require that all firearms be held secure. Even if you are a gun owner and not required to own a gun safe to store your guns where you live, you should still consider buying one. 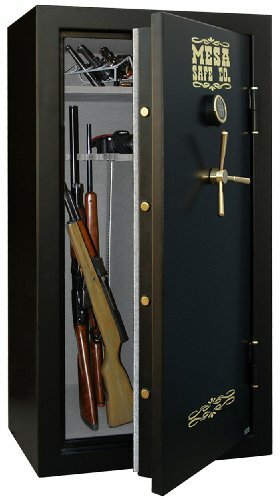 The best gun safes can protect your guns and valuables against burglars, children, fire, natural disasters, and water. The concept of gun safes has existed for much longer than you may think. In the early 1700s when the United States was a colony of Britain, many gun laws existed. For example, in Boston, it became illegal to fire a gun within city limits in 1713. Throughout the 1700s, the storage of guns, black powder, and ammunition in the home was regulated. It was during these times that the first gun cabinets become popular with Americans. People needed a way to keep their guns secure in their home. Granted, many of these cabinets were incredibly nice looking and in the home primary for decoration, but others had locking mechanisms that were designed to resist unauthorized individuals from accessing the weapons. Eventually, someone got the idea to use metal locking cabinets instead of wooden ones to store guns, and the gun safe as we know it today was born. Today gun cabinets are almost exclusively reserved for decorative or display pieces rather than for serious security use because they have simply become obsolete in the wake of the gun safe. Gun safes continue to evolve, and there are a great variety of safes ranging from their locking type to how many guns or the types of guns they can hold and so on. Some safes are more traditional and utilize a standard key lock for a locking mechanism, while others may only open when the correct code is typed into a keypad. Recently, gun safes have become even more advanced with the advent of biometric safes that use fingerprint recognition from an authorized person to open. Gun safes are also available at a wide range of different prices as well, which we will talk about more closely in this article when we discuss the best gun safes by price. Others are designed to store just handguns and to be carried around in your car while others are still designed to hold multiple long guns in your home. Regardless of what you need a gun safe for or what your budget is, what’s important to note for now is the types of locks for gun safes. Let’s go over what the most popular types of gun safes are by lock. We also have created specific gun safe buyers guides that offer more options. This article covers the overall best gun safe in each category but if you are looking for a specific type of safe check out the individual buyers guides. A key lock gun safe is the most simple type of gun safe there is. It uses a standard lock and key in order to lock and open. Most key lock gun safes will come with at least two keys so that you’re not out of luck in the event that you use yours. 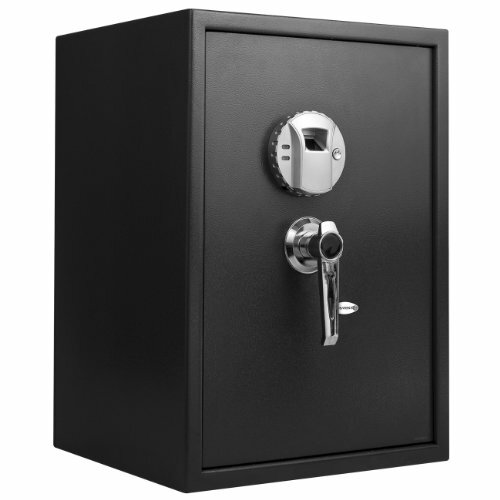 Key lock gun safes are also reinforced with a strong and durable steel plating and live bolts so that they cannot be pried open or drilled through. 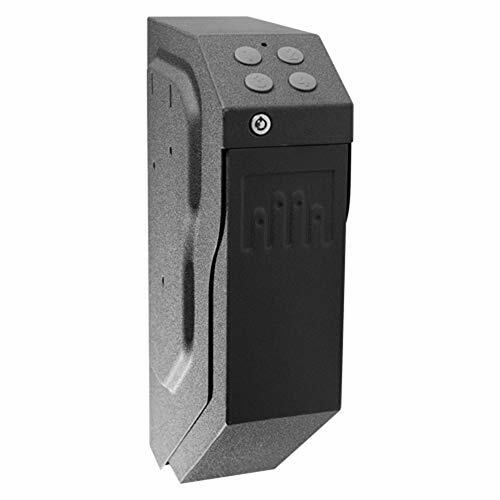 Electronic gun safes utilize a keypad locking system that is either electric or battery operated. The keypads vary in how many numbers they are programmable for but most safes vary from four up to six. The codes can also easily be reprogrammed for additional security in the event that you suspect someone has found out your current codes. You may still not trust an electronic gun safe if it’s locked only with the keypad. What’s to stop an intruder from bypassing the keypad and trying to open the safe to gain access to the contents inside? The answer lies in the physical design of the safe. Electronic gun safes use live locking bolts that don’t allow the door to be pried open on its own. Most electronic gun safes are also constructed out of a very tough steel so that they cannot be drilled through as well. And since there are literally millions of different possible combinations for a six digit code, it seems heavily unlikely that an ordinary thief would be able to gain access into your electronic gun safe. It’s important that you take care of the keypad on your safe with great care because it is not invulnerable to corrosion, damage from water, or damage from fire. You also have to keep the code a secret at all costs because if anyone finds out about it, there will be nothing to stop them from getting into your safe. Biometric gun safes use more advanced technology. They come installed with a fingerprint recognition sensor that can program up to thirty authorized fingerprints in order to open. This is one of the most secure methods of locking up your safe. It’s very quick and easy to unlock, meaning that you can open the safe and access your gun inside in a hurry in the event of a home invasion. 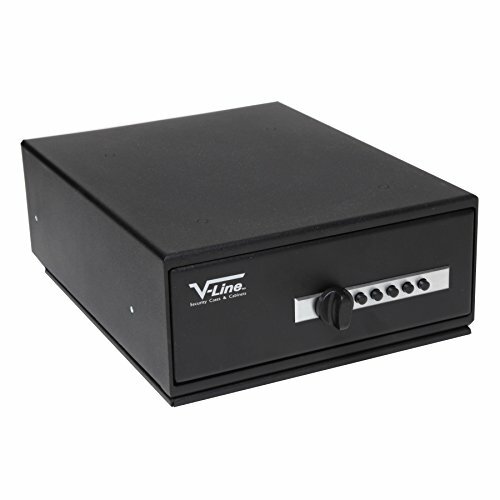 As with electronic gun safes, biometric gun safes also come equipped with a durable locking mechanism and a strong steel plating, so they cannot be pried open or drilled through. The biggest downside to biometric gun safes is the price. Since they use a more advanced technology, they are naturally more expensive. You can buy a cheaper biometric safe if you want to but this is not especially recommended because they won’t be able to store as many authorized fingerprints. The cheaper versions also have a higher ejection rate than the more expensive models meaning they may not always recognize a fingerprint that has been authorized. With a wheel and pin combination lock gun safe, the pine wheel will have a combination of at least three numbers that will need to be turned in the exact order if the safe is to unlock and open. Many gun owners prefer this kind of gun safe because it is arguably the most resistant to fire or flooding; whereas fire or water can damage the biometric system or keypad of a biometric or electronic safe. For example, the wheel and pin combination lock gun safe will generally not be susceptible to these hazards. On the flip side of things, you also have to make sure that each of your chosen numbers are not close together. If the numbers are too close together, the dial may skip your selected number. The multiple lock gun safe, as the name suggests, uses at least two locking systems in order to open. Most models will allow you to set only one lock or both of them if that is what you desire. A few models may require that both locks be secured and then unlocked to reopen the safe. These models are far better for security, but they also put you at a disadvantage if you need to get to your gun quickly should there be an intruder in your house. The most common types of multiple lock gun safes being sold on the market today are key locks with digital keypads or biometric systems with digital keypads. It can be an understandably difficult task to search for the best gun safe that fits your needs. Reading this article so far has hopefully informed you that there are more types of gun safes than you might have initially anticipated, but that doesn’t mean that the process for searching for one needs to be any more confusing. To help you think about what you need, we’ll go over the different qualities that you should look for when buying a safe. Remember that there is no such thing as a universally best gun safe, but there is such a thing as the best gun safe for your needs. Because not everyone will need a gun safe for the same reason, we will discuss the importance of size, quality, lock style, security rating, fire rating, weight, cost, and warranty when determining the best gun safe for your needs. This is perhaps the most important quality to look for in a safe. You shouldn’t spend money on a gun safe that’s too big for the few guns that you have, but you also would be wasting money on a small gun safe that can’t hold all of your guns. In fact, the number one reason for why gun safes are returned to the store is because they weren’t big enough to fit the customer’s needs. In order to determine the right size of gun safe for you, first decide the amount of storage you need. Do you want to keep in your bedroom or office to store your long guns? Do you want to have it bolted onto the wall by your bedside? Do you want to travel with it in your car? Once you know what you need the safe for, then you will have a better idea on the size you need. If you’re only going to store one gun and a spare magazine in a portable car safe, for example, then your safe does not need to be very big at all. On the other hand, if you want to store your entire collection of hunting rifles, shotguns, and all of your ammunition, you’re going to need a pretty tall and wide safe. Take our word for it: Not all gun safes are created equal. Some safes are higher quality than others, meaning they’re made out of more durable metals and can better resist fire and water. Regardless of what type of safe you want or what you will be using it for, quality is of utmost importance. A simple thin metal cabinet is not going to resist burglars or fires, so why would you want to waste your money? Your safe needs to be high enough quality that it can last you for your entire life and be passed on down to future generations. A thin metal cabinet is not going to protect your guns from burglars or a fire, it also isn’t going to last you for the rest of your life. A gun safe is not just something that you buy and forget about – It’s an investment. Whether you’ve spent a lot of money investing in the guns you own or you inherited them from family members, it’s important that you have a quality gun safe to keep them secured. Beyond the body of the gun safe, another important component that needs to be very well made is the door. After all, the door is what gives you access to the items inside, right? The door of your gun safe needs to be a minimum of a quarter inch of solid steel. The more expensive safes will use a steel door that measures up to a half inch. We already talked about the locks that gun safes use in our discussion of the different types of safes, but we’ll talk about it again here. The type of lock that your gun safe uses is one of the biggest features that you will need to think about. Your lock is what determines how easily or with how much difficulty an intruder will be able to break into your safe. It also determines how quickly you will be able to open the safe as well in the event of a home invasion. While we can’t tell you what the best gun safe lock is, what we can tell you is a series of tips that will help you make a choice. When looking for an electronic safe, look for one that is EMP resistant so that your safe will not be disabled in the event of an EMP attack. S&G safes tend to use electronic locks that are EMP resistant. If resistance against intruders if your first priority, then you should go with a multiple lock safe so that they have as many hoops to jump over as possible before they can get into your safe. If being able to access your guns quickly in a home invasion scenario is your first priority, then a multiple lock gun safe should be the last safe that you choose for the same reasons. Since electronic locks are factory sealed, any kind of warranty they ship with should become void once they are opened so keep this in mind. Electronic locks are not as maintenance heavy as you may think – the only real maintenance involved is having to replace the battery every few months. If you opt for a mechanical lock system, you would be wise to have it serviced at least once every three to five years by a certified technician. Biometric, electronic, and wheel and pin combination locks offer the best protection against intruders. If intruder security is your top priority, avoid going with a simple key lock gun safe. The security rating of your safe is another important quality to look at, regardless of what you want to protect in your safe. Most people who buy a gun safe do so in order to protect firearms, ammunition, money, personal documents, old family photos, baseball cards, jewelry, or a combination of those items. As a general rule of thumb, go with a gun safe that has a BF rating at the very least. Fire ratings are another top consideration that you need to take into account when on the market for a safe. As a general rule of thumb, go for a safe that has a fire rating of at least one hour. Any safe with less protection than that is not going to be very effective at adequately protecting your guns and other valuables from a home fire. A majority of gun safes being sold, however, are designed with a fire rating of only thirty minutes or less. Why would you want to spend your money on a safe that cannot protect your guns and other valuables from a fire for at least an hour? Many home fires can even last more than an hour! As we mentioned before, gun safes are an investment. They are designed to protect your guns that you spent your hard earned money on or that otherwise have strong sentimental value to you. A fire rating of at least one hour is also imperative if you will also be using your gun safe to store important and personal documents. In fact, many people buy gun safes just for the sole purpose of storing their personal documents. Regardless, paper burns at a temperature of 451 degrees Fahrenheit. Meanwhile, most house fires will burn anywhere from 800 up to 1200 degrees Fahrenheit. A safe with less than one hour of fire protection is not going to protect your personal documents long enough for them to last through the house fire. It helps to boost the fire rating of the safe by resisting heat and flames. It also helps to resist water and moisture, which are natural enemies of guns. If any moisture or humidity gets on your guns, it can cause even the nicest of your guns to rust. What’s neat about fire seals, however, is what when a fire is occurring the seal will actually expand in order to block out the smoke and fire from entering the safe. It will also expand when in contact with water that may be sprayed onto the safe to put out the fire. The best fire seals are capable of expanding up to five or six times their original size, which will seal the entire space in between the door and frame of the safe. If a gun safe is constructed out of steel, it’s going to be heavier than any kind of a RSC safe. The point of this is that one way you can compare how quality your safe is will be to compare the weights. A steel safe is not just heavier than an RSC safe, it’s also more durable and offers more ample protection as well. However, even if the RSC and the steel safe are of roughly the same height, width, and diameter, the steel safe is going to be a lot heavier. Just by looking at the weight of the two safes should be enough to tell you which one is more durable even if you don’t know that one is steel and the other is an RSC. Another reason to look at the weight of the gun safe is to determine how durable it will be because gun safe manufacturers will utilize all sorts of tricks in an attempt to get their customers to believe that their safe is better than the safes of their competitors. However, something that no gun safe manufacturer will be able to mislead their customers about is the weight of the safe. An RSC gun safe that’s about 60 inches tall will weigh anywhere from 400 to 800 pounds. Although this may sound like a lot, you will realize that a steel gun safe of the same height will way twice that much at around 1,000 to 1600 pounds. In fact, a 60 inch steel safe without any kind of fireproofing should weigh 600 to 700 pounds on its own. The only real downside to a heavier gun safe is the fact it’s more of a pain to move. However, do not let the hassle of moving the safe influence your decision not to buy a heavier one. Remember that a gun safe is an investment, and it’s also one of the most important investments that you can make if you are a gun owner. A heavier gun safe is always going to be the stronger and more durable one, so it’s also going to be the wiser investment. In the end, it all comes down to price, right? No one’s that denying that gun safes are expensive. Yes, you can buy models for only a couple hundred dollars, and we will discuss some of these models later when we talk about the best individual gun safes by category. Many of the highest rated gun safes can cost up to a 1,000 or more dollars. This may sound like a lot of money until you take into account the fact that your safe could be protecting $10,000 to $15,000 worth of guns and other valuables. Suddenly, a $1,000 gun safe doesn’t seem all that expensive, does it? At the same time, you can’t buy a gun safe that you can’t afford. Spending money that you don’t have is easily the worst financial habit that you can get into and you don’t want to start here. Therefore, you’ll want to find a gun safe that strikes the right balance between both being within your budget and being high quality enough so that it’s actually a worth investment. A good rule of thumb to follow is for your gun safe’s retail price to be between ten percent to thirty percent of the total value of the contents that will be stored inside of it. Any gun safe that goes beyond this figure may just become unreasonable, while any safe that’s less is likely not going to be a worthy investment. How a safe falls in that ten to thirty percent rage will be dependent on a variety of different factors. If you have ten guns that are each worth $500, then that’s a $5,000 collection of guns and in the ten to thirty percent range, you should expect to pay between $1,000 to $1,500 for a safe. What if you have a few guns in your collection that are worth thousands of dollars on their own? What if you have had guns passed down to you that have high sentimental value and are not replaceable? In this kind of an instance, it’s not implausible for your gun collection to be worth tens of thousands of dollars or for some of your guns to be even priceless to you. This kind of a situation, under the ten to thirty percent guideline, would require that you buy a safe that cost several thousand dollars. If you don’t have this kind of money, does this mean that you just don’t buy a safe at all? The answer is no, but it does mean that you may have to break the ten to thirty percent guideline while still buying the best quality safe that is within your budget. Buying a safe that’s worth ten to thirty percent of the contents within it is only a guideline; it’s not a rule. It does at least give you a general idea of the amount of money that you should be prepared to spend on a safe if you truly value the items that you will be storing inside of it. Last but not least, you should not ignore the warranty that comes with your safe. Some safes don’t even come with a warranty, while others come with lifetime coverage for either the whole safe or the individual pieces of it. Only you can decide if a good warranty is something that you are willing to spend more money on. Replacing a broken lock on a safe can cost you anywhere from $500 to $1,000, so having a good warranty that covers that cost would be nice and save you money. In contrast to this, if you don’t think your lock ever will become damaged or if several hundred dollars is no issue to you, then there’s probably no issue to not having a warranty at all. So far in this article, we have learned about the different types of gun safes and the qualities and factors that you need to take into account when on the market for one. For the rest of this article now, we’ll go over what we feel are the best gun safes available on the market by category. If you’ve been looking for a gun safe in a particular category, the specific safe that we recommend for that category should definitely the safe that you look into for your home or car. Though the GunBox is a relatively newer product, it has become very popular within the few years of its existence. 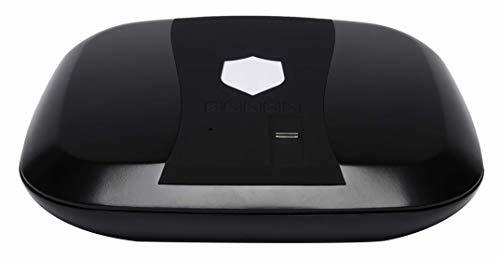 It’s a slim and sleek biometric handgun safe that can either be carried in the car with an adapter that can be bought separately or kept by your bedside at night, which makes it one of the most versatile biometric handgun safes available. The other advantage to buying the car adapter separately is that it can charge the safe right from the car, so replacing batteries periodically will not need to be a major concern of yours. In regards to actually opening the safe, you can either press your fingerprint into the scanner or you can open it with the aid of an RFID bracelet. Either of these methods enables you to unlock the safe and access your firearm quickly in the event of an emergency. 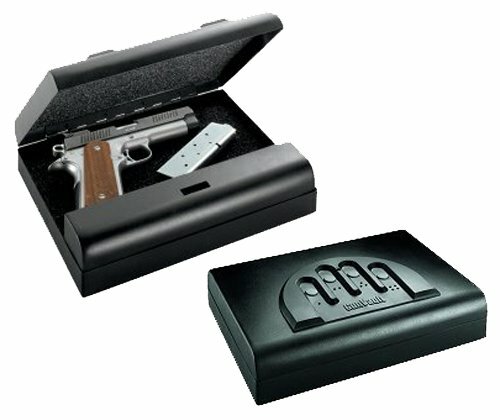 All in all, the GunBox is our top choice for a biometric gun safe. It’s versatile, it’s high quality, and it’s slim enough that it can be used in many different applications. Learn more about the best biometric gun safes here. 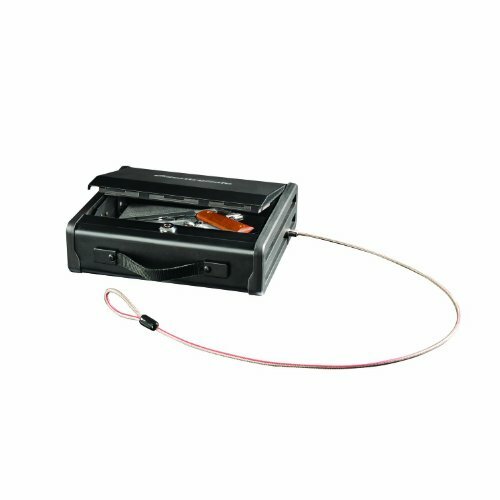 One of the most popular safes for storing a firearm in a vehicle is the GunVault MV-500 STD. This safe is large enough to hold a full size semi-automatic pistol in addition to at least two spare magazines. How the GunVault works is it secures to the bottom of your seat with a metal cable. Simply reach under the seat to grab your gun. It’s also designed as a rapid access safe, so it can be opened very quickly should you ever need to defend yourself against a carjacking. While there are many great fireproof gun safes out there, we will give the title of best fireproof gun safe to the Stack-On Executive Fire Safe. Stack-On has ETL tested the safe to verify its fire resistance at 30 minutes of 1, 400 degree Fahrenheit temperatures. It ships with a limited five year warranty and a limited lifetime guarantee, which are significantly longer than guarantees and warranties that come with virtually all other safes. On the inside, the Executive Fire Safe contains two shelves for you to hold pistols and ammo, with a carpeted interior to prevent scratching. There is no alarm located on the inside of the safe so it can’t alert you should anybody break into it. While some maybe consider this a con, the reality is that the strong steel and combination lock makes breaking into this safe nearly impossible in the first place. The Executive Fire Safe is heavy since it’s designed to hold a lot of guns, so it will take multiple people to move it to your desired location. Keep this in mind if you decide to buy it. Many people desire a quick access gun safe where they can grab their home defense handgun, but they also don’t want an electronic lock safe where they have to worry about the batteries running out. If you’re one of these people, the V-Line Slide Away safe is a perfect option for you. This is a five button and non-electronic safe that is incredibly simple operate. There is enough space to hold up to two pistols, while the safe itself is constructed out of a durable twelve gauge steel. Total weight of the V-Line Slide Away is just 21 pounds, so moving it around from place to place will not be an issue. Sentry is a well known company in the world of safes and there’s good reason for it. They make high quality products! Their PPQ Portable Pistol Safe is no exception and it earns our nomination for the best portable gun safe on the market. Sold with a one year warranty from Sentry, the PP1 Portable Pistol Safe is perfectly adaptable to be used both inside and outside of a vehicle. The hinges that hold the door to the actual body of box of the safe are pry resistant, while you will find that the interior of the safe is filled with a high compression and soft foam to avoid inflicting scratches on your guns and other valuables. There’s enough space in the PP1 to either hold one pistol and two spare magazines or two pistols with no spare magazines. The Mesa 30 Gun Fire Resistant Safe is excellent for anyone who wants to store rifles and shotguns in addition to ammunition, personal documents, and other valuable possessions. As the name of this safe clearly implies, the Mesa is capable of holding up to thirty long guns at once. It’s also been tested to resist falls up to two stories high and to resist 350 degree fires for up to one hour. The door panels, shelves, and walls are all fully upholstered in order to prevent scratching on your guns. The lock the mesa is an electronic lock that is battery powered and can be recharged with an internal USB AC power strip. The lock itself is protected by a hard plate that is drill resistant. One of the most secure safes that you can buy is the Barska Biometric Floor Safe. It’s been built by Barska to not only hold handguns, but cash, checks, and other important personal and financial documents as well. These items are all kept secure in the safe thanks to the three-point steel locking bolts that make prying your way into the safe virtually impossible. Instead, the safe opens by pressing your fingerprint onto the scanner and then turning the handle. In other words, you don’t have to worry about losing a set of keys or forgetting the combination. The real reason why we have selected the Barska Biometric safe as the best home safe is because it has enough space and shelves to hold all of the important valuables that you would want to store at your home such as handguns, money, checks, documents, and more while also weighing less than 50 pounds. This means that you can carry it to any part of your house in contrast to a larger safe that would be stationary while still holding the same items, other than long guns. Total dimensions on the Barska Biometric Safe are a length of 14 inches, a width of 13 inches, and a height of 20 inches. It includes storage shelves that are removable, a protective floor mat, and is designed to run on four AA batteries that come included with the safe. If you want gun in a safe by your bedside that you will be able to grab quickly to respond to a home invasion, the GunVault SV5000 Speed Vault Handgun safe is one of your best options. It features a quick activation drop down drawer when opened, so your pistol will be right there with the grip facing you for a clean draw instead of you having to fumble around inside the safe. The safe itself is constructed out of an eighteen gauge steel with a foam interior that will protect your gun and prevent scratching. To open the safe, you simply have to press the combination code in a digital keypad on the outside of the safe and the drawer will drop down to present you with your pistol. Fort Knox is a company that specializes in manufacturing handgun safes that are constructed in the United States. 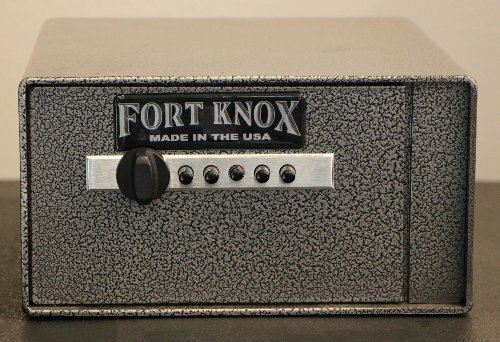 Their Fort Knox Personal Pistol Box is built out of a 10 gauge steel and has a steel door with a thickness of 3/16”. Total dimensions on the safe are 12.5 x 10 x 4.5 inches, making it one of the largest handgun safes on the market and fully capable of holding multiple handguns at once. The Fort Knox does weigh a hefty 22 ounces, which is heavy for a pistol safe but this is due to the thickness in the steel. The interior of the safe is lined with carpeting for padding and also comes with four pre-drilled holes for you to mount your pistols on. As with all Fort Knox products, the Personal Pistol Box sells with a Lifetime Warranty. If you want to spend just under $2,000 for a gun safe, the Snap Safe Modular Titan Safe is an excellent safe. It holds plenty of room to hold up to 12 rifles or shotguns in addition to several handguns and space for optics, personal documents, and ammunition. The lock on the safe requires a six-digit combination that must be typed in using an electronic keyboard. The inside of the safe can be configured practically however you want it, as you can arrange and rearrange shelves in order to make more room for long guns, handguns, or for ammunition and accessories. The Titan has been tested to withstand fires at 2,300 degrees Fahrenheit for up to an hour. The safe also features eight locking bolts and will be shipped to you pre-drilled for mounting floors. All in all, it’s a very high quality, modular, and versatile safe that is designed to be configured to the needs or desires of the user, which is why we say it’s our top pick for a gun safe just under $2,000. Priced a little less than the Titan is the Stack-On 28 Rifle Fire Resistant Safe. It can hold even more long guns than the Titan can at 28 rifles and/or shotguns, though it also lacks the high number of configuration options that the Titan has. For a mid-range safe that’s capable of holding multiple weapons, it’s hard to go wrong with the Stack-On. The Stack-On has been rated to withstand fires at temperatures of 1400 degrees Fahrenheit for up to an hour and can also resist two feet of water for up to three days. This will make it a perfect choice for any homes or basements that are susceptible to flooding or water damage. The Stack-On utilizes a Velcro system for handgun storage, which naturally helps to take up as little space as possible and leave more room for long guns, ammunition, and other valuables. Available for less than $1,000 is the Mesa Company 14 Rifle Gun Safe even though it’s built as durably and has more features than many other gun safes that are sold for over $1,000. The Mesa is one and a half inches thick of pure steel and weighs over 500 pounds. It includes hardware so that it can be bolted into the floor, making it a true stationary safe. What really makes the Mesa a great safe is how secure it is. The steel it is constructed out of is designed to resist fire for over one hour at 350 degrees Fahrenheit, and the fireproofing abilities of the safe will activate automatically in conditions of high heat. The Mesa has also been tested to easily withstand being dropped at heights of two stories without breaking or cracking. The Mesa utilizes an electronic combination system that is additionally bolstered by a spring re-locker to protect itself against anyone who tries to break into it. If you’re on a tighter budget and want a quality gun safe for less than $500, you need to give a serious look at the Stack-On Fire Resistant Gun Safe. 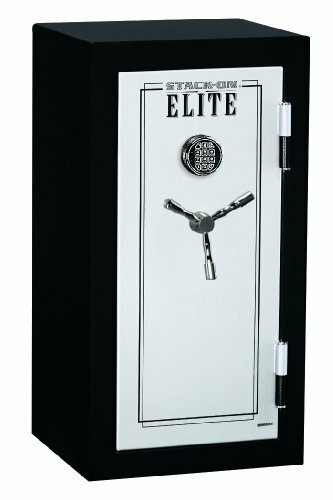 This safe is intended to be very affordable while also providing you with several of the features of a more expensive model. Despite costing less than $500, the Stack-On still has plenty of space in order to store several long guns (fourteen to be exact) and handguns in addition to other valuables and ammunition. It’s also slim enough so that it can fit nicely into an office where space may be more limited. The Stack-On also utilizes a smart shelving system in order to store handguns and ammunition. The smart shelving system employs slots and brackets that allow you to arrange and re-arrange them however you like. In other words, how you store your valuables and firearms with the Stack-On is not dictated by the manufacturer. If you need to have enough space to store plenty of long guns while also not wanting to spend the extra money on a more expensive safe that might have nicer features and slightly stronger durability, there’s little reason to say no to the Stack-On Fire Resistant Gun Safe. 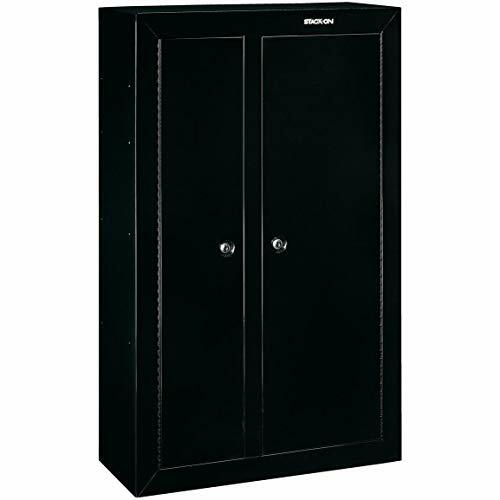 If you’re on an even tighter budget and want to spend less than $300, Stack-On offers a 10 Gun Double Door Steel Security Cabinet. 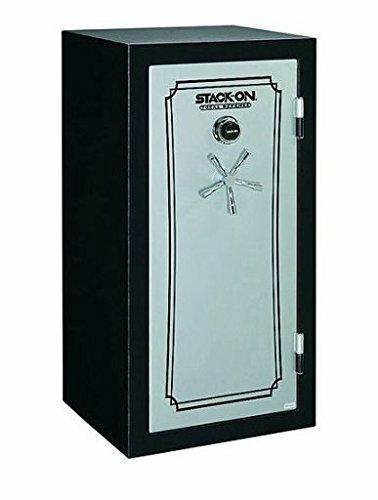 Despite being priced extremely low, the Stack-On Double Door is still built like a safe and not like a general security box. For one things, the hinges are all fully welded so prying the safe open is not an option. Furthermore, the safe locks into place in three different locations, and each is equally secure. A double bitted lock negates the possibility of someone picking the keyhole, and you also have the option of bolting this safe directly to your floor. All of the hardware that you need to do this are sold with the safe itself. It’s highly recommended that you bolt this safe to the ground because it weighs only 60 pounds. If you don’t bolt it and you have a burglary, it’s very much possible for the burglar to simply carry away the whole safe. As the name suggests, there is enough space in this security cabinet to store up to 10 guns. Five of those guns can be long guns and the Stack-On Double Door is tall enough to store models that measure up to 54 inches. All mounts inside the safe are fully padded to keep your guns free of scratches and other scruffs. An additional shelf on the top of the safe is a great place to store ammunition, accessories, and other valuables. Sold for less than $200, this is by far the most cost-effective long gun safe in this list. Some might be hesitant to even call this a safe. After all, it is named a ‘security cabinet,’ but this is intended only for those who are on the absolute smallest of budgets. 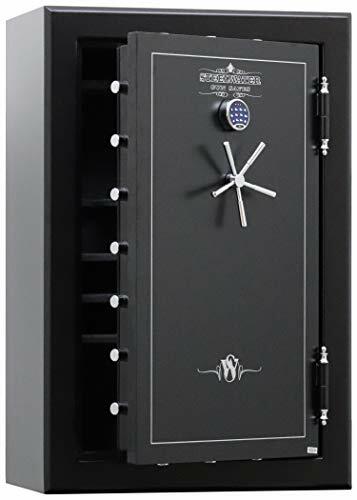 This safe is not going to be invincible against water or fire by any stretch of the means, but it still offers ample security protection against burglars. That’s why it earns our nomination for the best gun safe for less than $200. Measuring 54 inches tall, the Stack-On Steel Security Cabinet has enough space to hold up to eight long guns. It is essentially a slightly smaller version of the 10 Gun Double Door Security Cabinet that we just talked about previously. As with the Double Door, a top shelf is present on the Security Cabinet for carrying ammo and other accessories, and the interior is foam padded in order to present scruffs and scratches. Earlier in this article we mentioned that there is no true best overall gun safe. After all, different reasons for owning a gun safe will require different kinds of gun safes. Nonetheless, if we had to name a production long gun safe that is of the highest quality and where money is not an issue, we would go with the Steelwater Extreme Duty Gun Safe. 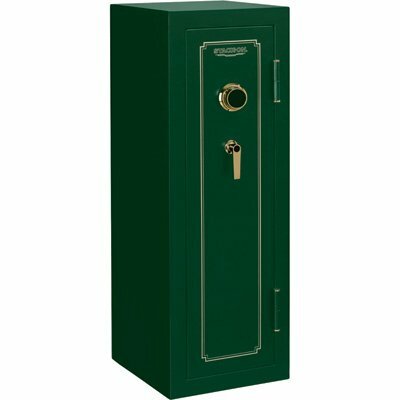 This is a simply beautiful safe that features nine gauge steel, the ability to resist fire at temperatures of 1875 degrees Fahrenheit for two hours, and an 8x hard plate that protects the drilling, lock, and gear drive. The Steelwater is also capable of holding up to thirty three long guns and any number of handguns that you can fit on the shelves. Selling at a price of around two thousand dollars, though with a limited lifetime warranty, this is truly a safe that will last you for the rest of your life and can be passed down through future generations. Reading this article you have learned about what the different types of gun safes on the market, the qualities to look for when buying a gun safe, and the best gun safes by category. This information is intended to help make your search for a personal gun safe easier, so you can more carefully narrow your choices and make the best educated decision. Thank you for visiting Reloadingpresso.com. If our article has helped you make a decision about the best gun safe for you, please click through to Amazon using one of our buy buttons. We are an Amazon Affiliate website and how we keep our website running is through the small commission we receive when you purchase a gun safe from Amazon after visiting our site. There is no extra expense for you – the price is the same as if you went to Amazon directly. For more information on gun accessories please visit our blog.